No Mello Roos!! View home with private pool and spa with waterfall! This home is move in ready and has been upgraded throughout with custom paint and wood floor. Open floorplan. Living and dining areas as you enter the home. Kitchen is upgraded with granite counters, island with breakfast bar, stainless steel appliances, and lots of cabinet space. The open family room has a fireplace with custom tile surround and sliding glass door to backyard. Downstairs has tile flooring throughout. Upstairs you will find the dream master suite with its own private deck with view, upgraded master bath with frameless glass shower enclosure, soaking tub, dual sinks and walk in closet. There are two additional bedrooms, guest bath, laundry area and wood floors upstairs. No detail has been missed in this home ? recessed lighting, plantation shutters, ceiling fans, upgraded fixtures and a Nest thermostat, just to name a few. 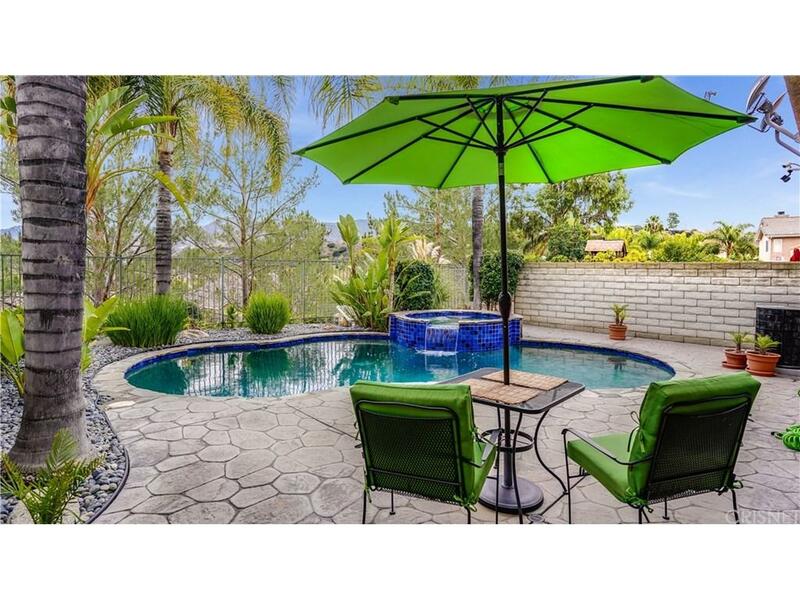 Prime Stevenson Ranch location. Close to award winning schools, shopping, and easy freeway access.